Our door frames are designed with the strength and endurance to guarantee steady, secure performance year after year. Made from lead-free 100% virgin uPVC these multi-chamber profiles provide outstanding insulation properties, a perfect weatherproof fit and superior strength. 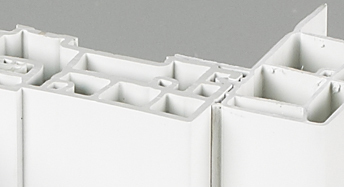 Designed for optimum performance, our one-piece continuous sill is manufactured to increase strength and rigidity. door frames are designed to endure the day to day punishment and perform flawlessly for years.